Also serving communities of Glassport. There are 53 Assisted Living Facilities in the McKeesport area, with 7 in McKeesport and 46 nearby. The average cost of assisted living in McKeesport is $2,075 per month. This is lower than the national median of $3,346. To help you with your search, browse the 254 reviews below for assisted living facilities in McKeesport. On average, consumers rate assisted living in McKeesport 4.0 out of 5 stars. Better rated regions include West Mifflin with an average rating of 4.2 out of 5 stars. Caring.com has helped 5 families in McKeesport find high-quality senior care. To speak with one of our Family Advisors about assisted living options and costs in McKeesport, call (855) 863-8283. McKeesport, Pa., has a population of 19,731 and is situated within the Pittsburgh metropolitan area. It has a fascinating local history as a coal mining town, reaching back to the 1700s. Nestled on the confluence of the Monoghalea and Youghiogheny Rivers, McKeesport offers a wide range of activities and services for seniors, including parks, restaurants and museums — as well as seven assisted living facilities. There are 56 other assisted living communities within surrounding areas. Assisted living in McKeesport, and all of Pennsylvania, is overseen by the Office of Long Term Living and is defined as any facility providing 24 hour general care, services, supervision and supplemental health care services for four or more adults. Assisted living in the state of Pennsylvania is also known as Personal Care. The cost of living rating for McKeesport is 22 percent lower than the national average, making it ideal for seniors who need to stretch their budget. Weather in McKeesport is generally in line with national averages. It does receive fewer sunny days, with McKeesport getting 159 sunny days compared to the national average of 205. The summer high temperature averages 84 degrees, while the winter average low is 21. There are many local arts and culture attractions to experience in McKeesport and close surrounding areas. These include the McKeesport Regional History and Heritage Center, the McKeesport Little Theater, the Pittsburgh Zoo and Aquarium and the Pittsburgh Clo Musical Theater. Allegheny County offers the Older Persons Transportation Program which provides low cost door-to-door transport from Monday to Friday for seniors who are unable to drive or take public transport. There are also two airports and four Amtrak stations within 20 miles of McKeesport. The McKeesport area is home to world-class medical facilities, including UPMC McKeesport and Select Speciality Hospital McKeesport, in the event of medical emergencies or illness. McKeesport has an array of community resources for seniors, including the Mon Valley Senior Community Center, an organization that provides a diverse menu of activities as well as normal, daily schedules. Assisted Living costs in McKeesport start around $2,075 per month on average, while the nationwide average cost of assisted living is $4,000 per month, according to the latest figures from Genworth’s Cost of Care Survey. It’s important to note that assisted living rates in McKeesport and the surrounding suburbs can vary widely based on factors such as location, the level of care needed, apartment size and the types of amenities offered at each community. Pennsylvania has a Medicaid program that is jointly administered by the federal government and the state of Pennsylvania. 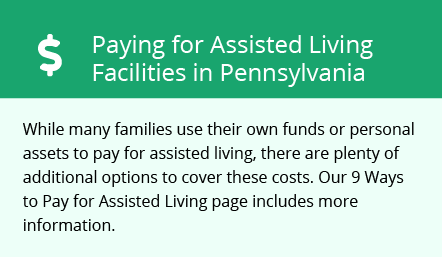 However, in Pennsylvania the Medicaid program does not usually cover the cost of assisted living, although it may cover some of the services required. The state can also provide a supplement to those already receiving Supplemental Security Income towards covering the costs of assisted living. Mckeesport and the surrounding area are home to numerous government agencies and non-profit organizations offering help for seniors searching for or currently residing in an assisted living community. These organizations can also provide assistance in a number of other eldercare services such as geriatric care management, elder law advice, estate planning, finding home care and health and wellness programs. To see a list of free assisted living resources in Mckeesport, please visit our Assisted Living in Pennsylvania page. Mckeesport-area assisted living communities must adhere to the comprehensive set of state laws and regulations that all assisted living communities in Pennsylvania are required to follow. Visit our Assisted Living in Pennsylvania page for more information about these laws.